We are excited to announce that the call for papers for MEOUG MAJLIS 2016 Conference is now open. If you have something interesting to present to the most active Oracle technology users and business leaders in the region, then submit your abstract today. 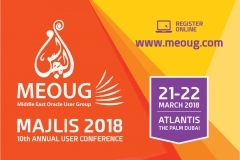 MEOUG welcomes proposals for presentations on a wide range of subjects from its customers, partners, analysts and other industry leaders. Real-life case studies and sessions that share transformational stories are encouraged. Of particular interest to the Oracle Cloud audience are speakers' observations of the market today, and how that is changing how businesses and End user think about and run their business and people processes. 1) Address the theme of the conference - If this is available when the call the for papers is announced then try to address the theme of the conference within your abstract. 2) Address the key data technical focus areas Cloude Journey, Cloud Operations, e-business Suite, Database, etc. If possible try to include one or more of these focus areas within your abstract. 3) Have a strong biography - You need to use your biography to differentiate and build credibility. This is an important topic because it allows you to differentiate yourself from all the other presenters who are trying to get speaking slots. 4) Have a strong business case - build your presentation around a strong business case, relevant to your industry and/or your target audience (DBAs, developers, architects etc). 5) Make the title and abstract interesting - Your title and abstract must be easy to read and make sure you introduce your main idea as early as possible. 6) Look at previous presentations, You can review all the titles and abstracts that were accepted and use them as guidelines for creating your own title and abstract for this year's conference. 7) Write clear outcomes - The majority of the best presentations have clearly stated outcomes. What do you expect that conference attendees will be able do or know at the end of your session? 8) Don’t submit your paper right away - Once you have a title and abstract show it to a few colleagues. Get some feedback. You probably know many people who’d be happy to give you ideas on making your proposal better. 9) Keep number of submissions low - You do not increase your chances of getting a paper accepted by submitting lots of different sessions.